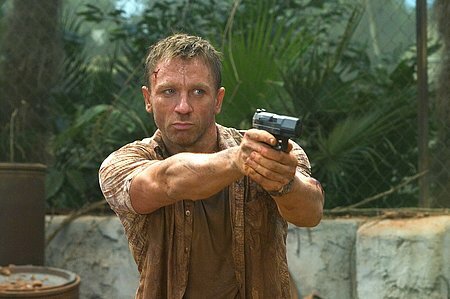 With the imminent release of Daniel Craig’s third outing as James Bond, Sam Mendes’ Skyfall (UK release October 26th), it seems like the perfect time to cross the film ranked 56th greatest film of all time by Empire readers a few years ago, Craig’s first Bond outing, Casino Royale. Now, if you ask me, #56 is pretty high up, especially when you consider that Goldfinger, my favourite Bond movie, is 110 places lower at #166, and no other Bond movies made it onto that list (You Only Live Twice appears in the Empire 5-star 500). Even if you take into account Casino Royale’s proximity to the release of the list, made just two years later, it’s still pretty damn high. Apparently, it’s better than Lawrence of Arabia, Annie Hall, 12 Angry Men, The Great Escape and literally hundreds of other films that, in my opinion, are far superior. But then I didn’t compile the list (though I did vote on it, and not for this film), so who am I to voice the opinions of others? Before I continue my now-trademark tirade of negative comments, I should probably point out that this is a very good film. It served as a much needed shot in the arm for a franchise left face down and drowning on a CGI-wave of Pierce Brosnan’s swarm and Madonna’s atrocious Die Another Day theme song. In a post-Bourne world it established itself as a gritty reboot, taking Bond away from the ludicrous gadgets and back to the basics of hand-to-hand scrapping in a public bathroom, whilst still retaining the sheer spectacle of fighting on top of not one crane but two. Every aspect of classic Bond is present, from the impossibly slinky and easily-bedded women to a nefarious villain with a silly name and mild physical deformity (Mads Mikkelsen’s Le Chiffre, with a scarred eye that weeps bloody, and asthma to boot). Yet everything feels a bit more real, a bit dirtier and scuffed around the edges. And this description is none more fitting than of Craig’s Bond himself. Yes, he looks impeccable whether wearing an immaculately tailored dinner jacket or a pair of swimming trunks that apparently make my girlfriend’s mother go all weak at every possible joint, and he’s always got a quip ready in his back pocket, but this is a Bond with flaws and imperfections, all to aware that the men he is up against may be more than his match. Take the early scene in Uganda, for example. Here, Bond must chase down and apprehend a suspect to obtain the passcode on his mobile phone, yet unfortunately said miscreant (Sebastien Foucan) is rather adept at long-distance sprinting, free-running and jumping off things that are ridiculously high up. Whilst he bounds around without a care in the world, remaining relatively scratch free, Bond is always a fair way behind, getting progressively beaten up and always opting for the easier route – hopping into a JCB digger or shoulder-barging through a wall rather than leaping through an uncomfortably small window. Here is a Bond who doesn’t need to show off when no-one is looking, he just wants to get the job done, and at whatever cost. I’ve always had a bit of an issue with Bond films. I’ll gladly watch any of them, even Quantum of Solace if there’s nothing else on, but the plots are usually a bit labyrinthine for me, which is only to be expected if they want to make each film different. I’m not quite sure of the main motivations in Casino Royale, but I’m fairly sure it’s got something to do with the stock market, although the basic point is that Bond infiltrates an extremely high stakes poker game with a $150,000,000 pot, in order to prevent Le Chiffre from winning it and doing something bad with the proceeds. Everything else is fairly superfluous. 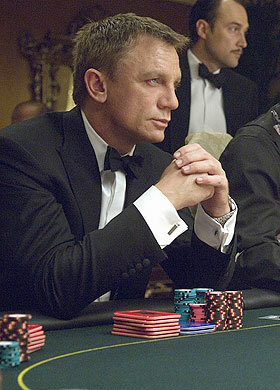 I’ve read elsewhere that setting most of a Bond film around a poker table is nothing short of sacrilege, but I found those parts to be fraught with tension and often interspersed with enough action to suffice, even if the film made poker out to be a game that only deals in the most improbable card hands ever. There’s a nice running commentary provided by Bond’s accomplices, Vesper Lynd and Mathis (Eva Green & Giancarlo Giannini), but I didn’t think it was that necessary to have so much exposition, considering how dumbed-down the game was. There were some very memorable set pieces, with the cold open of Bond achieving his double-0 status and the parkour escapade being particular high-lights, though I also enjoyed the stairway scuffle later in the film, showing how Bond had improved his jumping-and-punching skills from earlier. The testicular-torture scene may have gone a little too far, but it was well-handled and didn’t make me feel as squeamish as it could have done, and it’s more than compensated for by the various little moments of humour, and the record number of car rolls a little earlier. I approved of the expansion upon the relationship between Bond and M (Judi Dench), whose involvement in this franchise has cemented her presence as something of a British icon, and the rumours that this repartee has been increased ever further in Skyfall excites me no end. Bond is always at his best when bouncing off a superior – best seen with Desmond Llewelyn’s Q, and his utter, barefaced cheek clashes perfectly with Dench’s no-nonsense style. Though the last act may drag a little – the film clocks in at 138 minutes – the pace is fairly consistent throughout. There’s a lot here for Bond fans – more in-jokes than I remembered – and plenty for newcomers too. It may not be my favourite Bond film, but it definitely breaks the top 10, and maybe even the top 5. This entry was posted in 07/10, Choose Film, Empire Top 301, Empire Top 500, Review and tagged Casino Royale, Daniel Craig, Eva Green, Giancarlo Giannini, James Bond, Jeffrey Wright, Jesper Christensen, Judi Dench, Mads Mikkelsen, Martin Campbell by jaycluitt. Bookmark the permalink.